Link shortening – the process of turning a long, unwieldy link into a short and pretty one – is a common practice. While generic link shorteners (such as Bitly and goo.gl) can be useful in a pinch, they aren’t a solid long-term solution. Using them can lead to ineffective linking, which can harm both your search engine ranking, and your site’s credibility. Fortunately, dedicated link shortening tools – such as our own Pretty Links – let you beautify your URLs while also avoiding the pitfalls associated with shortening them. This enables you to create short, effective links that incorporate your brand. In this post, we’ll discuss some common reasons why generic link shorteners should be avoided. We’ll then show you how Pretty Links can be used to bypass these shortfalls. Let’s get started! Generic link shorteners, while popular and easy to use, aren’t often the best option for your needs. Let’s take a look at three reasons to avoid them, along with an alternative solution for each. Even the most well-known companies, including Amazon, brand their links. One major downfall of generic link shorteners is their inability to brand your links. While this may not seem like a big deal, branded links are important. For one, they expand the reach of your brand. They also appear more credible to internet users, which is critical if you want to drive more traffic. They can be included on your social media profiles. You can create an appropriate structure that better fits your requirements. This includes a concise, descriptive slug and relevant anchor text. To further your branding efforts, you should also consider guest posting and participating on industry forums. This offers natural linking opportunities. Essentially, anywhere you can display a pretty link should be thoroughly considered. When links are blacklisted by search engines, your site will be marked as ‘deceptive’. In simplest terms, blacklisted links are those flagged by search engines as spam. This means they won’t show on Search Engine Results Pages (SERPs), and using them can negatively impact your website’s search engine standing. This is a major reason to avoid generic link shorteners, as many have been blacklisted in the past. Use a highly-rated security plugin. Plugins – including Jetpack’s security features and Wordfence – can prevent malicious hacks. This will ensure your site isn’t blacklisted for malware. Avoid ‘black hat’ SEO strategies. While they may get you ahead on SERPs for a little while, the results won’t last. Unfortunately, blacklisting can still affect you, despite your best efforts. With this in mind, you can check the status of your current links with tools such as Dr. Link Check. Link reports – such as those offered by Pretty Links – give you insight into your links’ effects on internet users. 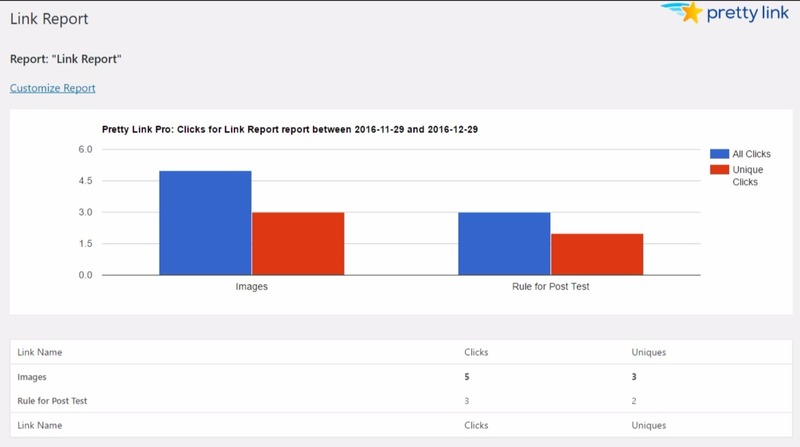 Finally, tracking and analyzing your links’ performance enables you to understand how visitors respond to your strategy so you can improve your efforts. However, the majority of generic link shorteners don’t offer this feature (and if they do, it’s poorly done). Perform split testing. The results will help you to make better decisions (such as more optimal link placement). Track visitor conversions. You can learn more about your visitors’ behavior, and how to use your links to increase conversions. The most crucial aspect of tracking is to implement what you learn. You may have to reconfigure your current linking strategy to do so, but the results will be worth it. Once installed and activated on your WordPress site, Pretty Links is a plugin that enables you to effectively shorten, brand, and track your links. It’s so simple, you can create your first link in minutes! We recommend you enable link tracking (Advanced Options > Tracking), then click Create. You can now use the new Pretty Link as you would any other, but with the added ability to track its progress (by going to Pretty Links > Reports). The use of generic link shorteners is common on social media, forums, and elsewhere across the web. However, they can be detrimental to your overall linking strategy, as you have no control over your links and your search engine ranking may even suffer. Instead, shortening tools such as Pretty Links enable you to fully incorporate your brand and monitor their performance to boot. The inability to brand your links. The risk of blacklisting by search engines. The inability to track your link results. Do you have any questions about link shortening, or how Pretty Links can be used to improve your current linking strategy? Let us know in the comments section below!